Brand new to our shores, Mamas & Papas have been popular in Britain for 30 years. These practical and stylish strollers with exceptionally well thought out details are worth a look. 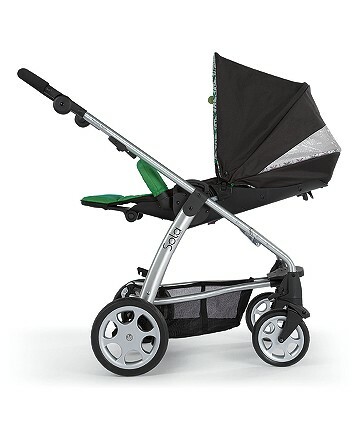 My first experience with one of their stroller, the Sola, has left me very impressed. The Sola is an exceedingly cute reversible seat stroller and it’s been a pleasure to have it for a visit. There’s very little to do really, pop on the wheels and canopy and you’re ready to go. 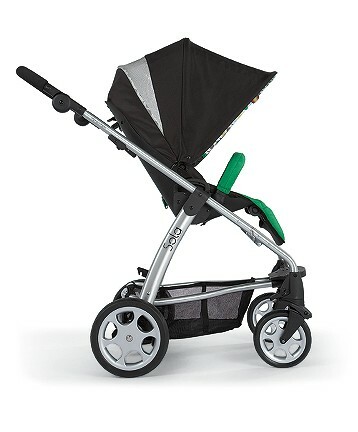 The Sola includes the chassis, seat and a rain cover and retails for $399.99 at Babies R Us. The Sola has many really great features. The most obvious is its appearance. I tested the Grass Sola and it’s beautiful. The exterior is all business, with a nice sleek modern chassis and a svelte looking black seat and canopy, perfect for a stylish mommy or daddy. The interior is all fun, perfect for baby and super cute. The bright Grass Green seat with the adorable multi colored retro tree design details is a welcome departure from a plain stroller seat. It’s happy, fun and everything a seat for a baby should be. This stroller will make everyone happy. The seat itself has an incredibly easy one handed recline and lays flat with an adjustable footrest. The seat also reverses very easily, just pop it on and off, nothing complicated to deal with anywhere. The handlebar is long with a pivot adjustability and you will not have to worry about ever kicking the axel. There is also an optional carry cot that is suitable for nighttime sleeping, which is great if you have a baby who will only sleep in a buggy. 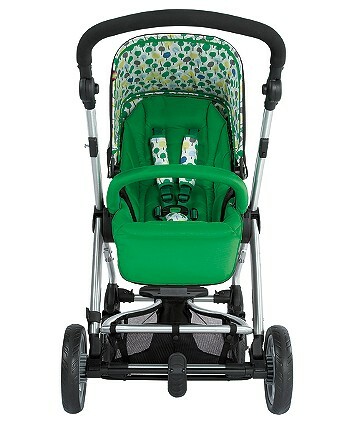 The stroller is also car seat compatible and adapters are available for Graco and Maxi Cosi. Other great features are the 4 wheel suspension, removable bumper bar and viewing panel in the hood. There is also a nicely sized basket and a very easy to use toe brake that I could easily do barefooted. Optional accessories include the carry cot, car seat adapters and coordinating parasol, diaper bag and footmuff (very nice as well). This is a stroller that will really take you far, with all of its great features and options and a rating of newborn to 50 pounds, you can absolutely make this your only stroller. The stroller is just as great to use as it is to look at. It’s so functional and you really can use it from birth and up. My 5 year old insisted on climbing right in as soon as he saw it because he just loved the way it looked. He is quite tall and over 45 pounds. His head was just touching the canopy and he said the seat felt very comfy. In fact, he liked it so much I pretty much had to force him out of it after a quick ride. Because of the adjustability of the straps the Sola also fit my 8 month old daughter perfectly. Some strollers with higher weight limits and seats that will hold a bigger child have harnesses that just don’t adjust down small enough for a baby, but this one does. The seat back is nicely tall and the adjustable footrest is great. I sat all 4 of my children in the stroller and they all fit well, 8 months, 22 months, 3 and 5 years. There aren’t that many strollers that we’ve tried that fit all four so well. The stroller is so easy to adapt to each of them, it was a pleasure to use. The recline mechanism is one of the easiest I have tried and it is truly one handed, both down and up. You just squeeze the release and move the seat forward and back. I could easily adjust it while rolling along, which is really handy. It also offers a full range of positions, from upright to completely flat, so perfectly adaptable for infants and older children, looking around and naps. The optional footmuff and the full recline would be great for a newborn as an option to the carry cot if you don’t want to make the additional purchase. However, Three of my children would only sleep in stroller a carry cot for the first two months or so, so having one was always more than worth it for us. The canopy is generously sized and the peekaboo insert is really nice when the seat is forward facing, so you can still see your passenger. If you want your baby to face you it is really easy to reverse the seat in an instant. Nothing to fiddle with, just pop off, turn and pop back on. I really love a reversible seat and it’s even better when it’s easy to reverse. It’s so great when they’re little and if you have a rather unsocial toddler, like my 22 month old, it’s nice for them to not have to face the world. For our first test ride, I took the Sola out around our neighborhood for a very long walk. We have a wide variety of terrain here, from broken sidewalks to tiny shops, so it’s always a good test. Despite the fact that the tires are not air filled, it rolled very nicely over everything. It of course won’t pop a curb on its own, but it’s light enough that it’s really easy to go up and down. The maneuverability is superb. It zipped and darted around everything in front of us, rolled through narrow spaces and tight corners with ease. The Sola is just as easy to push one handed as it is with two, no matter which child I had in it. In fact, it was so easy to push that when I traded strollers with my husband to see what he thought, I quickly asked for it back. He, however, insisted on using it a bit longer. The fold is also really easy and it’s fairly light at 22 pounds, so quite easy to move around. It’s great for in the car or for storing at home. I Love the color & pattern! Man, I wish I had one! It looks fabulous! How big are the wheels. Do you have photo of the stroller folded? I want to start out by saying that this stroller looks great and also that when it works, it is nice stroller. Now the downside – I bought this before my child was born this year and couldn’t wait to try it out. The first Mamas and Papas (Sola) stroller I bought had a faulty wheel so I had to return it. The second one came quick enough, but this one had problems in the fourth month of use. Here are the issues I had with this one – 1. I could not fold the stroller because the stroller is faulty and 2. It has a faulty buckle and I cannot strap my baby in properly. I then called Mamas and Papas to tell them about the issues and they said that it was my problem! Of course I was mad. Luckily, the retailer I bought this from agreed to return this, even though they originally told me to call Mamas and Papas directly. does it work for all car seat brands or only for graco and maxi cosi? does it works for newborns?